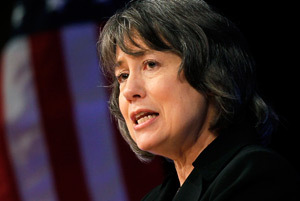 Sheila Bair, the populist bank regulator who warned in advance that the subprime mortgage crisis was coming, is stepping down on July 8 as chairman of the Federal Deposit Insurance Corporation. Her busy five-year term at the helm of the agency will come to an end on June 30, but Bair is staying on for the extra days to sign the final rule on so-called “living wills” for financial institutions that are deemed too big to fail. In a sense, the rule is an apt crowning achievement for the moderate Republican from Independence, Kansas, who championed the cause of the nation’s small and community bankers but crossed swords with some big-city bankers. “The dilemma policymakers faced in the failure of large, complex financial institutions resembles a hostage crisis,” Bair told a May 5 banking conference in Chicago. Bair is one of the more powerful women in the world, having served as an assistant Treasury secretary and a New York Stock Exchange executive. After getting her law degree, she became a policy aide in Washington to then-senator Bob Dole. It is hard to imagine that Bair, a blunt, outspoken and pragmatic leader who steered the FDIC through the financial disaster and closed the most banks since the savings and loan crisis of the 1980s, will go quietly home to Kansas. It seems more likely she will make her presence felt again on the national and international scene, although she prefers Main Street to Wall Street or Pennsylvania Avenue.